Fernando - Fernando. Vinyl LP. Bleep. Brazilian techno producer Fernando Seixlack, DJing and creating regularly under seixlacK and Innsyter, drops an LP of lo-fi electro, techno and art pop brilliance on L.I.E.S. 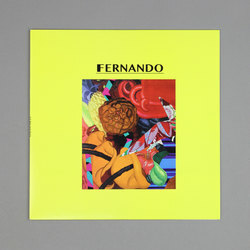 With impressive releases so far on L.A. Club Resource, Digital Tsunami and a selection of other imprints, Fernando adopts a new moniker under which to experiment with his latest LP. Melding the creepy vocal samples that command tracks like ‘Procrastinator’ and ‘Transcendental Grater’ with the almost disco or new wave elements of ‘Actual Job’, Fernando arrives at a location where his talents are only exceeded by his imagination. Compared in the album’s description printed by the label as a cross between Arthur Russell, Ariel Pink and PPU, Fernando’s latest LP glibly defies the expectations of a conventional techno work.